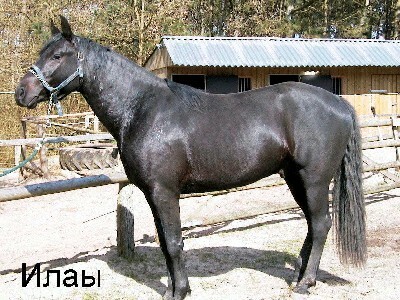 Anglo-Karachai horses are a variety of Kabarda horse that are bred specifically in the Karachai republic, Russia. They tend to be of the most robust type of Kabardas horse and split off as their own breed during the 1960's. The introduction of Thoroughbred blood was what created the Anglo-Karachai horse. They were originated by crossing English, German, and French Thoroughbreds with local Karachai horses. The breeding unofficially started in the early 1870's, but it wasn’t until the mid 20th century before the breed took hold. Anglo-Karachai horses are 15.2 – 16 hands high. They have a slight ram’s head facial profile. They have a straight line back, well-muscled loin, a lovely sloped croup with a low set flowing tail, and a long neck with very oblique shoulders (although shoulder position varies depending on how high the Thoroughbred breed-share is). They are calm and collected and are ready to work with incredible direction capacity. They also possess an easy, well-balanced gait.